Brynn Harper never dreams that her job working with Nicole, a young woman fighting substance abuse, will reconnect her with someone from the past. She's become adept at burying the hurt. Garrett Davis messed up his life big time by getting in with the wrong crowd. It cost him everything - his family and his relationship with Brynn. He gets his life together and finds purpose in helping others. Susan Crawford is a new-to-me author I met on Facebook. I picked up her book even though I don't usually go for romance minus a suspense or historical context. 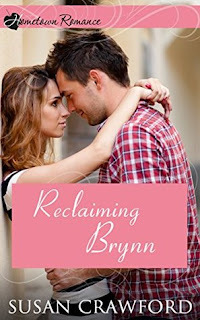 Reclaiming Brynn held my interest, and I liked both main characters. She did a good job making them realistic. The plot, setting, and supporting characters were well done. Overall, I'd give Reclaiming Brynn four stars. If you like sweet romances with a faith thread, this is worth picking up. I'll definitely look for more of the author's books and hope she'll write some longer novels. Disclaimer: Neither the author nor the publisher requested this review. I didn't receive any compensation, and, as always, all opinions expressed are mine alone. Writers: If you write fiction, do you prefer doing novellas or full-length novels? Why? 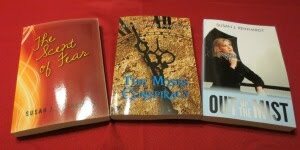 Readers: What are your thoughts regarding novellas and full-length novels? Which do you prefer - a short, quick read or a longer, more detailed story? Please share. Thanks for sharing this new-to-you author, Susan. I'm always on the lookout for newbies, and trust your judgement. I prefer full-length novels to novellas, unless it's a Christmas story. During November and December, reading a short story fits in better with the busyness of holiday planning and baking. Thanks for asking! BTW, I am giving away a free kindle version of my SHORT book, Shock the Clock on my blog this week! Hi Jeanette - I've been going out of my way to find new-to-me authors. We all started somewhere, and I'm grateful for those who picked up my books. Newbie Corner - What Is Head-Hopping?